In this fast, exciting, image-lovin’, creative world, there is a special and valuable opportunity for artists to really shine. 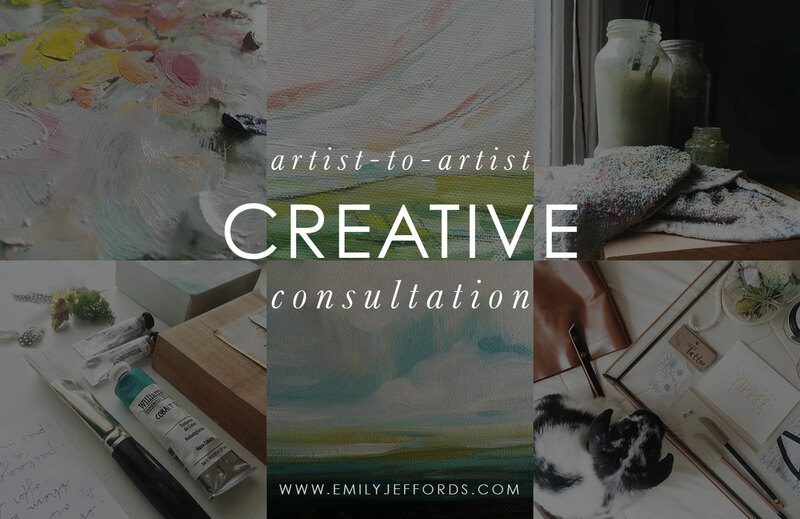 I am excited to let you know that I am offering creative consultations to artist, makers, and creatives! These consultations are perfect for people who are interested in growing their online business through organic storytelling and lifestyle branding. Your audience wants to get to know you – to share in your passion and to catch your vision. While we talk, we’ll discuss several ways to do this clearly, naturally, and elegantly. I’ll share past successes and failures as well as ways you can refine your brand to share your story more clearly. I would LOVE to work with you to strengthen your creative brand. Consultations start at $45 for a small group chat or $75 for a one-on-one consultation. Usually held over video chat, these talks usually last 50-60 minutes. After we talk I will send you a PDF full of goodness and info for you to review at your leisure. Please email shop@emilyjeffords.com and we’ll set up a time to chat! Hello! I came upon your website today via WordPress. Very thrilled to have found you. Your work is beautiful, and I look forward to perusing and reading your past articles. Hello, Emily! I just nominated you as one of my favorite bloggers for the One Lovely Blog award. You can read more about it on my blog, http://missjulietpoe.wordpress.com/2014/09/30/one-lovely-blog-award/ Have a wonderful day!